The Amazing Spider-Man is spinning a web in theaters, trapping international crowds in massive numbers. And while Rittenhouse Archives has put together an impressive assortment of costume cards in their Amazing Spider-Man mini factory set, it doesn't have much in the way of autographs. To its credit, the set's lone signer is leading man Andrew Garfield. 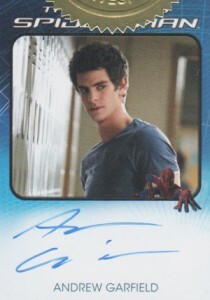 But that doesn't mean trading card collectors don't have any Amazing Spider-Man autographs to track down. It just means looking elsewhere. 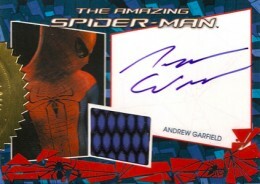 Garfield has three different autographs in the 2012 Rittenhouse Amazing Spider-Man factory set. Each one comes with one of two different basic signature cards of the star. One has him as Peter Parker, the other as the costumed hero. Rittenhouse made just 444 sets, meaning there are 222 of each card. They also made an autographed costume card as a four-set incentive. That card has a print run of 111 cards. 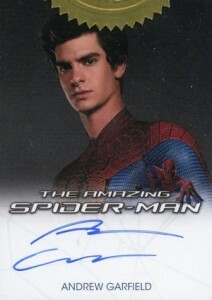 Besides Garfield, four other big names from the blockbuster have autograph cards. Rhys Ifans takes the spot as the film's villain, The Lizard. Ifans last appeared to mass audiences in another major franchise -- Harry Potter. 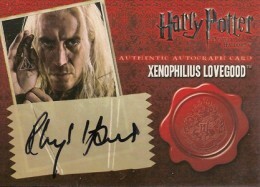 His lone autograph card can be found in 2010 Artbox Harry Potter and the Deathly Hallows Part I. The card is somewhat tough to come by. It has also seen major upward movement in recent months. The last three recorded sales on eBay have gone from $25 to $51 to $85. Don't be surprised if more pop up as the film releases and Ifans' profile is raised. Denis Leary plays Captain Stacy, Gwen Stacy's dad. The comedian has had a successful career over the last two decades. He has appeared in such movies as Demolition Man, Wag the Dog, A Bug's Life and all of the Ice Age movies. Oh, yeah, there was Operation Dumbo Drop too. However, Leary will always be remembered for starring in TV's Rescue Me. It's a dark comedy-drama that looks at a group of dysfunctional New York firefighters in the wake of 9/11. 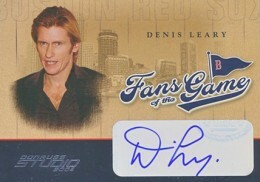 Leary's lone autograph card can be found in 2004 Studio Baseball Fans of the Game. Collectors should expect to pay $35-50 for the card. There is also an unsigned version of the insert that can be had for a couple of dollars. Martin Sheen is a Hollywood legend. His lone autograph card is also one of the hobby's overlooked gems. Other than the fact that the card itself is kind of ugly. Sheen has an autograph in 1999 SkyBox Babylon 5 Profiles, based on the popular sci-fi TV show. The actor is almost unrecognizable as an alien. This hurts its overall appeal. 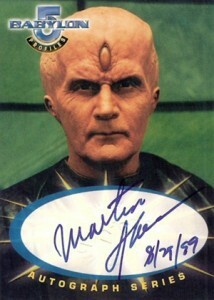 Currently, the Martin Sheen autograph can be found for well under $40. Perhaps his key role in The Amazing Spider-Man will give it a much-deserved bump. What's a Marvel movie without Stan Lee? The comic book legend appears in The Amazing Spider-Man as a school librarian. Lee has appeared in several sets over the years, including the recent 2012 Upper Deck Marvel Beginnings II. 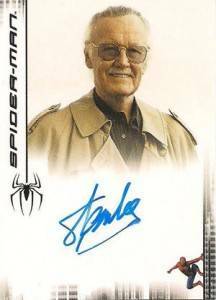 Spider-Man fans may want to look for the 2007 Rittenhouse Spider-Man 3 Stan Lee Autograph. Collectors can expect to pay anywhere from $60-300, depending on the set. Lee also did 100 sketch cards in 2006 Rittenhouse The Complete Avengers, which can sell for up to $1,000. Click on the links to shop for individual cards on eBay. 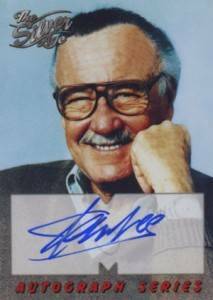 Stan Lee also has a Fans of the Game autograph. Thanks for the reminder. That guy’s signature is everywhere.